What is the value of a phone call? To someone behind bars, a phone call can be a lifeline to loved ones and the outside world. But it often comes at a high cost. In Cook County Jail alone, inmates and detainees have placed more than 20.4 million calls since 2008, generating nearly $60 million in revenue. Who profited? Securus Technologies, one of the nation’s largest providers of inmate phone services—and Cook County government, which made $26.1 million in commissions during those years, according to county data. Securus has been the vendor for inmate phone services since September 2008. Commissions often are used to pay for services, equipment or facilities unrelated to the cost of maintaining the calling service, and they drive up the cost of each call for inmates and their families, according to the Federal Communications Commission. Some advocates take it further, saying phone commissions help fund mass incarceration. Such criticisms have led the FCC and some Illinois legislators to consider either reducing or eliminating commissions collected by prisons. While an Illinois bill would impact commissions at prisons run by the state Department of Corrections, the FCC decision would affect commissions at prisons and jails across the country. The federal agency is expected to decide next month whether to cap in-state inmate phone rates. Effective last year, the FCC capped interstate rates at 25 cents a minute for collect calls and 21 cents a minute for prepaid and debit calls. In a news release in October, the agency stated that the cost of in-state calls remains exorbitantly high. The issue is important because studies link regular contact between inmates and their loved ones to significantly lower recidivism rates, the FCC said. Some states prohibit prisons from collecting commissions on inmate phone calls, including Ohio, which eliminated them this year. Two counties in Illinois—Champaign and Cook—are examples of how local governments handle phone rates. The counties have comparable rates, charging 17 cents and 17.5 cents per minute, respectively. However, Champaign County Jail gets by without commissions, while Cook County Jail has a 47.6 percent commission rate, according to a January 2015 FCC filing. The Champaign County Board voted in 2005 to eliminate commissions, which had brought in about $14,000 a month. The board transferred funding from the county’s General Corporate Fund to make up the difference, said County Administrator Deb Busey. The board “had a concern about the negative impact on the families of those that were incarcerated when those fees were charged,” Busey said. It would be impossible to know how many of the more than 3,000 sheriffs in the United States don’t accept commissions, a representative from the National Sheriffs Association said. But several advocates said the only one they knew of was Champaign County’s sheriff. The association supports commissions as a source for funding rehabilitation programs and other inmate services. In response to criticism about high call rates and profits, Cook County officials have passed a series of cost-cutting amendments to the Securus contract since December 2012. An amendment passed in 2012 lowered rates, while another passed in 2014 both lowered rates and reduced the percentage of commission the county receives from 57.5 percent of revenue to 47.6 percent, according to county documents. A proposed amendment, which was introduced last month and will be considered in committee and by the Board of Commissioners in September, would lower the cost of a 15-minute phone call from $2.63 to $2.25 and reduce the pre-paid card charge from $6.95 to $3.95. The amendment would also set international call rates at 28 cents per minute, which is substantially lower than rates from contracts in other large counties, such as Los Angeles. Frank Shuftan, a spokesman for Cook County Board President Toni Preckwinkle, said the board might enact more cuts when it convenes next month to review another proposed change and possibly consider extending the Securus contract, which expires in December. “We believe it is unfair for families to be burdened with excessive costs to communicate with inmates,” Shuftan said in a statement. Cook County gives inmates a free call when they are booked or when they phone their public defender. 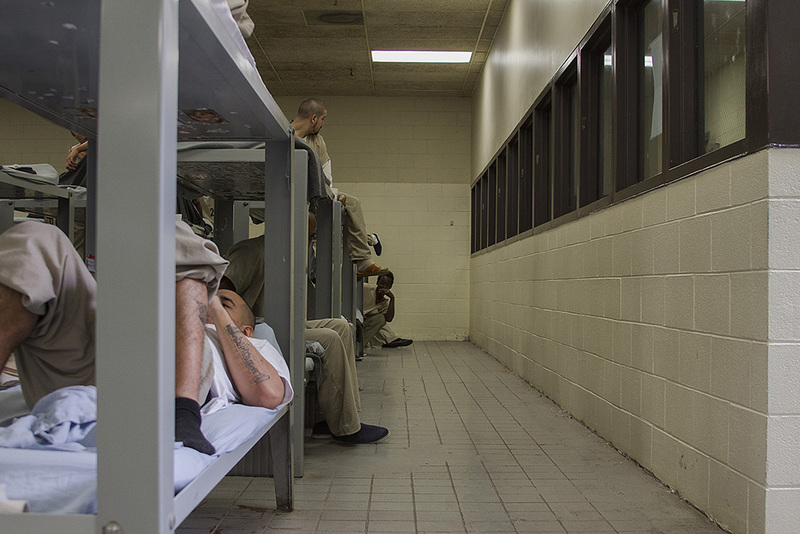 Inmates deemed to be indigent are allowed a set number of free calls. Securus, based in Dallas, is owned by ABRY Partners, a major private equity firm. The company serves more than 2,600 clients, including law enforcement and corrections agencies, and more than a million inmates across the country, according to its website. The company signed a three-year contract with the Illinois Department of Corrections in 2012 and again in 2015. In 2013, the state amended the original contract to reduce call rates and lower the state’s commission rate from 87.1 percent to 76 percent. Total commissions paid to the state in 2013 equaled about $13.4 million. Securus has put muscle behind protecting its business. The company hired Jay Doherty, president of the City Club of Chicago, as a lobbyist for state and county contracts, records show. Howard Skolnik, who was formerly the head of the Nevada Department of Corrections and a former IDOC employee, is listed as a lobbyist for Securus on the state prison phone contract. 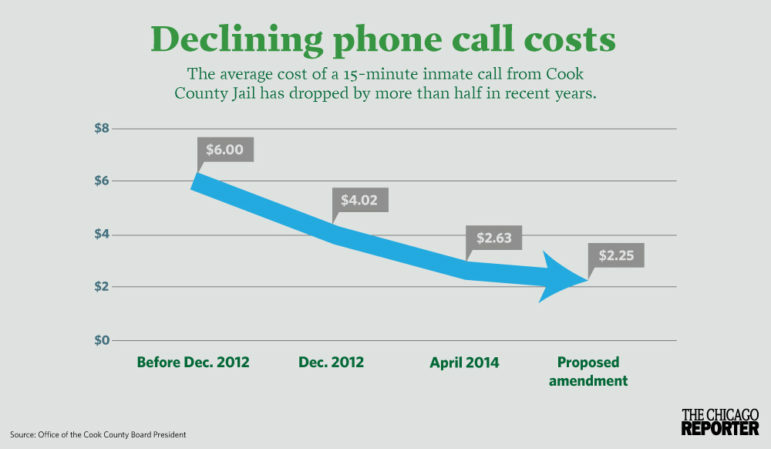 Former Cook County jail director Cara Smith, who is now the jail’s chief strategy officer, said officials understand the need to keep the cost of phone calls affordable. Last year, county officials renegotiated the Securus contract to both lower rates and the share of call revenue paid to the county. The current contract is structured so the county recoups labor costs for the time jail employees spend handling inmate phone calls and managing the phone system. A cost study conducted by the county found that about $2.4 million a year is needed to recover those costs. Securus paid Cook County $2.8 million in commissions in 2014, more than $1 million less than the county received in both 2012 and 2013, respectively. Smith noted that many detainees are behind bars because neither they nor their families can post bond. Their economic situation also impacts their ability to make phone calls while they are there—an important reason to keep rates low. “It’s important to stay connected to people you love, who care for you, particularly when you’re in custody, particularly when you are facing criminal charges and an uncertain future,” she said. But he said keeping the cost of calls reasonable is the most important thing. Is ‘orange’ the new green? The prevailing view is that incarceration costs big bucks. But on the flip side, many businesses make money. No one is upset with a fine of $10,000 for those arrested for DUI? No one is upset that the same inmates can be charged $350 per hour by an attorney? So why are people upset that the same people above (rapists & murders) are being charged $5.00 for a 5 min phone call? Being upset about each of those issues is not mutually exclusive. Socioeconomically disparate impacts are a huge problem rampant throughout the entire US criminal justice system. Along with lowering the rates, Cook County needs to make sure the fees to fund an account are also reduced. In some instances, it costs over $14 to deposit money into an inmate’s phone account..that needs to drop to about $3.00…about the same as the cost to use an ATM.